A simply stunning Bowman 42 for sale. Moulded in 2006 but not completed until 2009 she presents superbly. 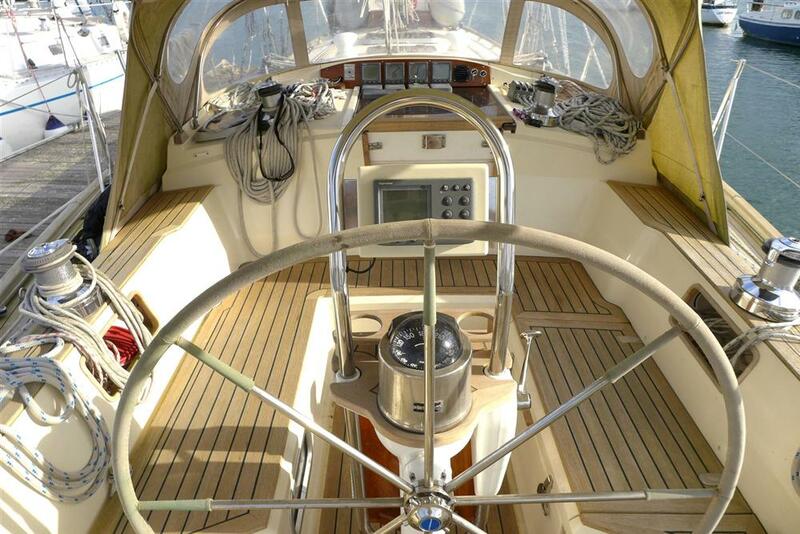 Fitted out with many bespoke features and attention to detail she must be one of the nicest Bowman’s available. 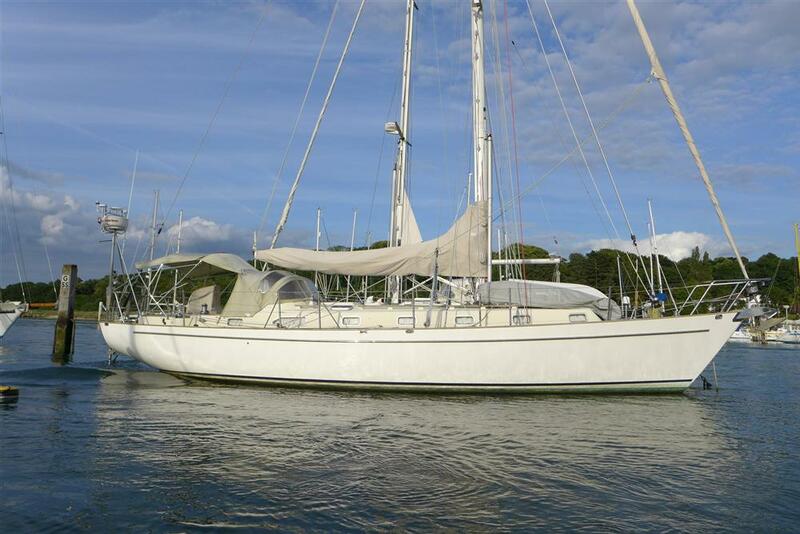 Recently reduced, she is great value for a yacht of this calibre. 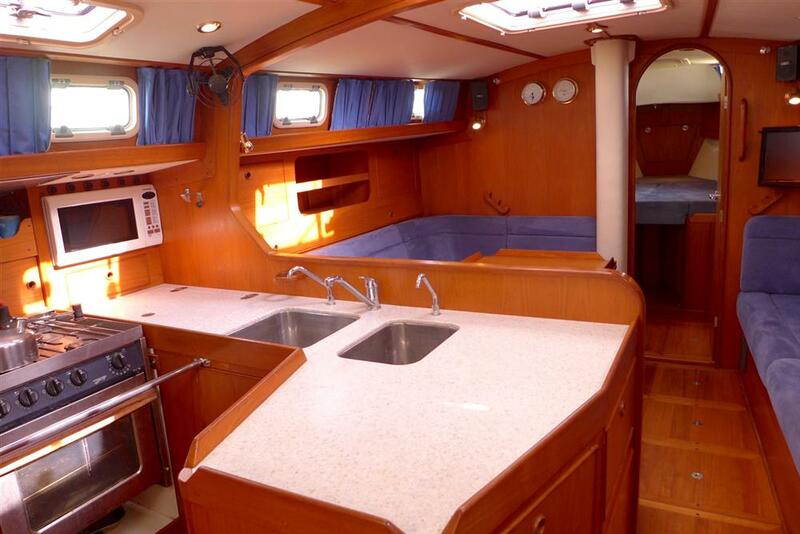 High quality systems and fittings were specified by her owner with long distance cruising very much in mind. 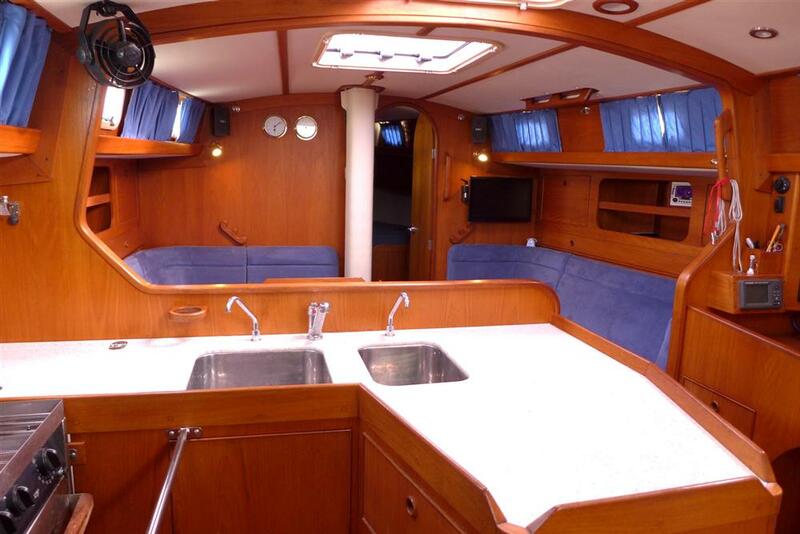 Her safety equipment is geared towards ARC requirements and she is an elegant yacht more than capable of traveling far and wide in comfort. “The Bowman 42 is an upgraded and modernized version of the Bowman 40. 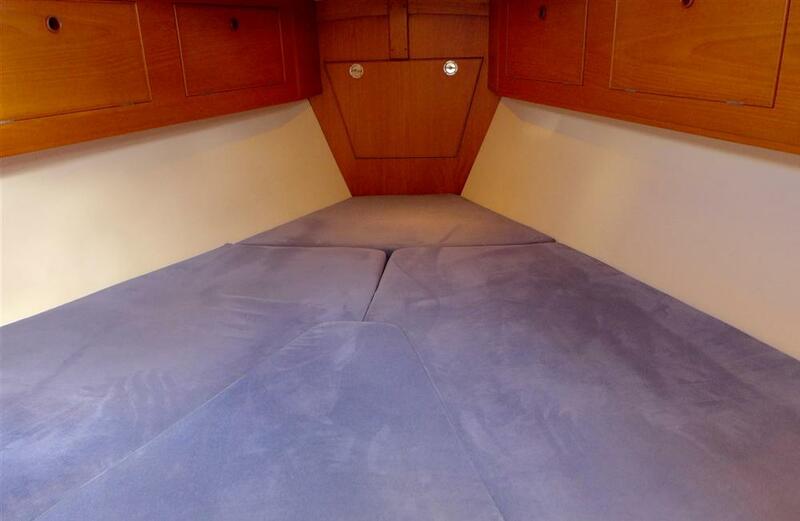 The counter stern has been lengthened in order to create more stowage space in the lazarettes and a sleeker appearance to the yacht in general. 12v DC water maker by Echo Marine Ltd.
Digital Yachts AIT250 class AIS. The joinery is teak veneered plywood, solid timber of high quality teak used where appropriate, all teak surfaces are finished with Epifanes rubbed effect varnish. The hull above the water line is lined with insulation. All lockers are plywood lined, covered in ribbed barley side-lining. 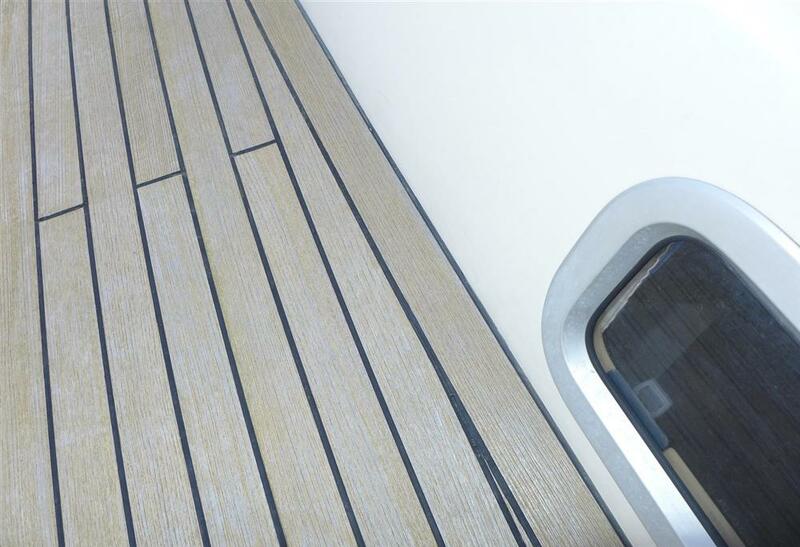 Deck heads are lined with off-white vinyl covered foam. All locker doors and drawers have secure finger catches (push catches in the saloon). Hanging lockers have hanging rails. 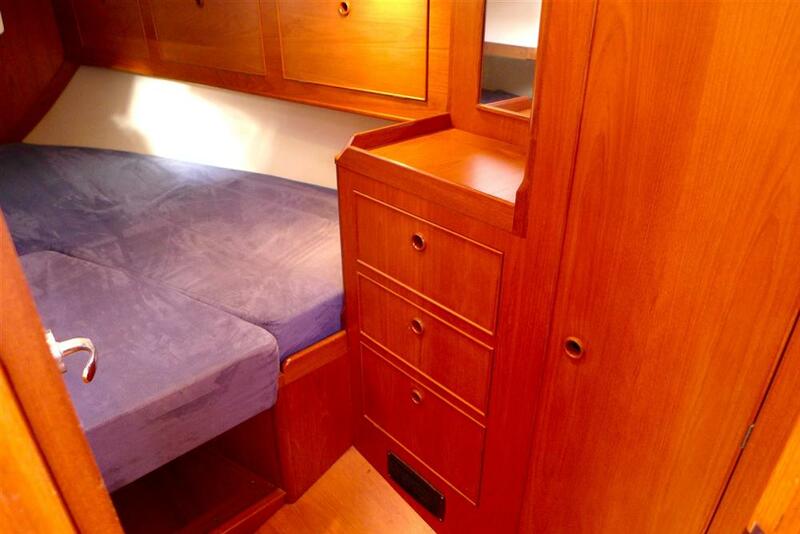 All cabin doors are fitted high quality furniture with retaining catches where necessary. The cabin sole is constructed of plywood with 5mm solid teak top. Cabin sole panels are either screwed down or fitted with lifting rings. All panels can be secured for bad weather. 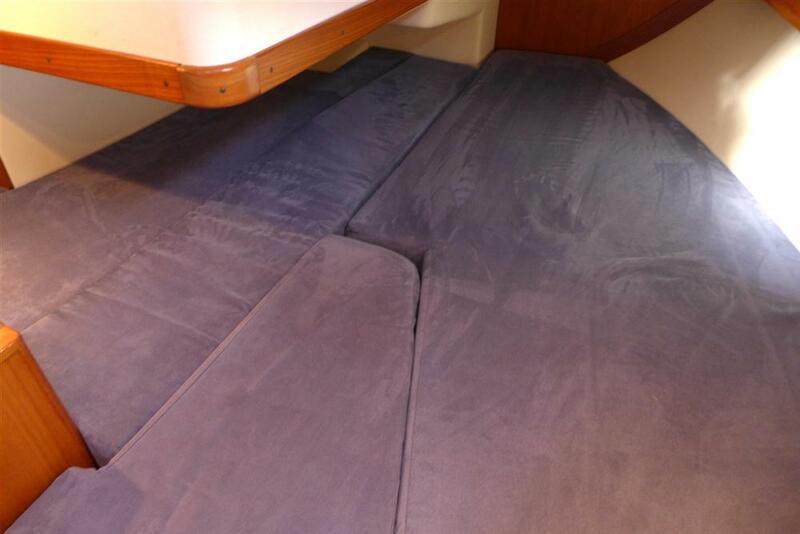 All berths are fitted with lee-cloths. 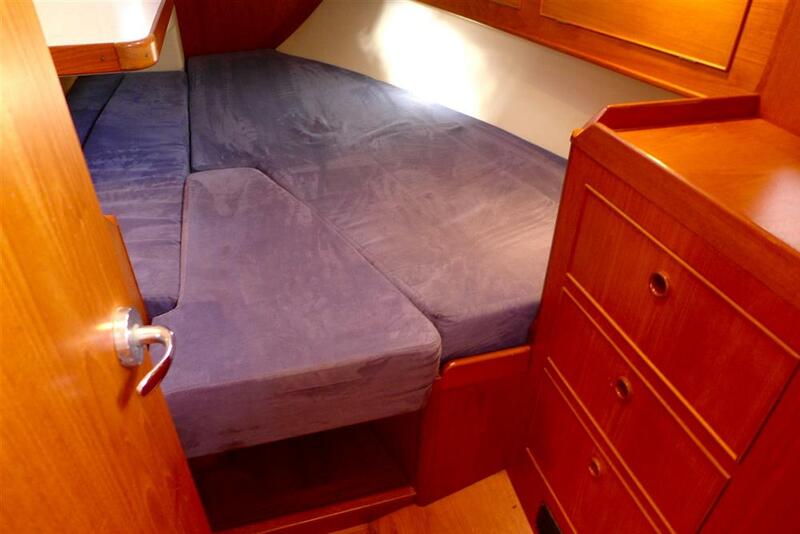 Double berth with stowage under. 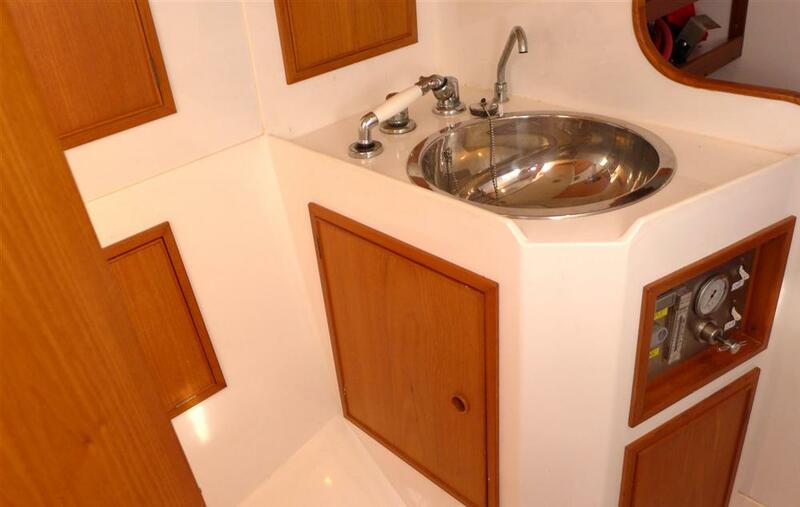 Vanity unit and hanging locker to starboard, doors to saloon and heads. Emergency exit through forward hatch. Thermostatic control to shower, stainless steel wash basin. Jabsco manual head, lockers behind head and wash basin. Teak grating over shower tray, mirror and radiator. 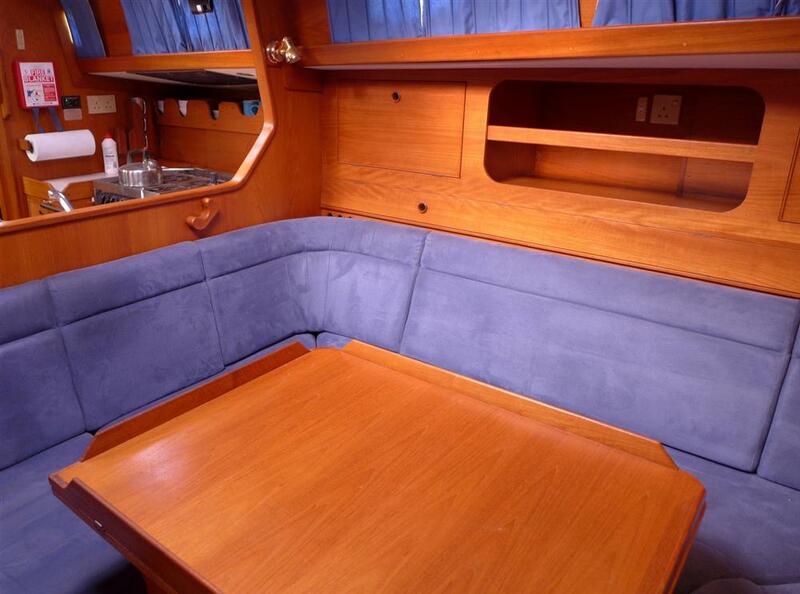 Dining arrangement to port with water tank under seat and cave locker behind backrest. Lockers, bookshelf and pipe cot above. 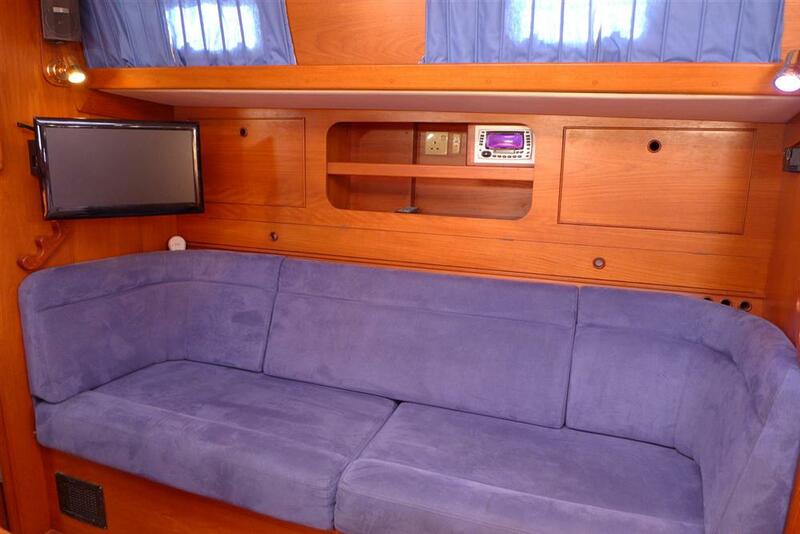 Settee berth to starboard with water tank under and storage behind backrest. Fabric upholstery on 5” combined foam. Large table with bottle storage below. Foot pumps for cold fresh and salt water. Mixer tap for hot and cold water. Top access to storage locker. Frigomatic AV35F refrigerator, 90 litre fridge, 18 litre freezer with through hull water cooling. 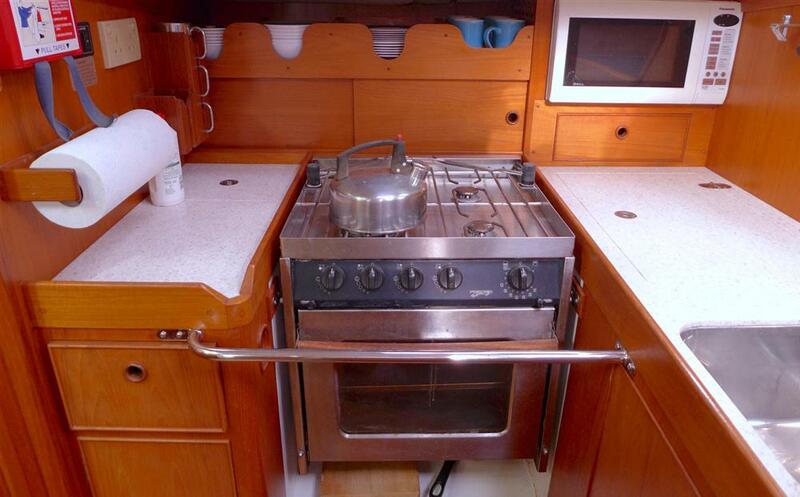 Force 10 cooker with oven, gas alarm with shut-off valve. Working surfaces in Corian type material. 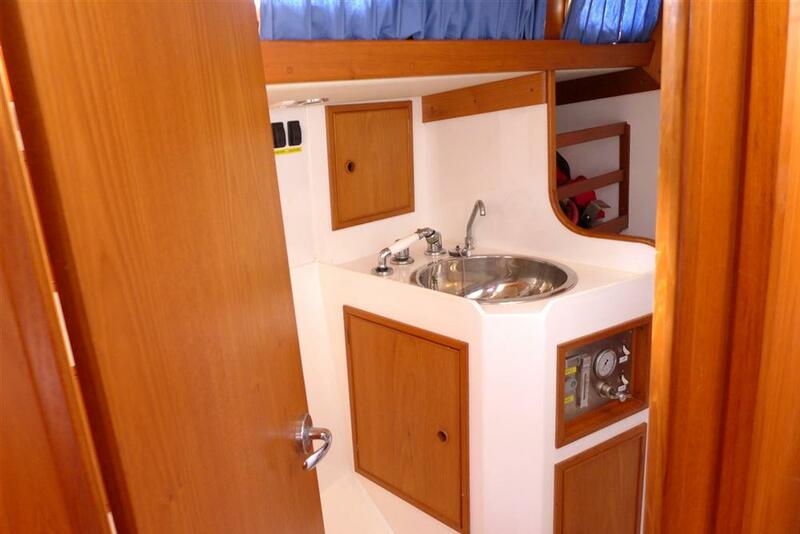 Stowage lockers and cutlery drawer, fitted stowage for crockery and mugs. Chart table stowage for charts, with drawers under. 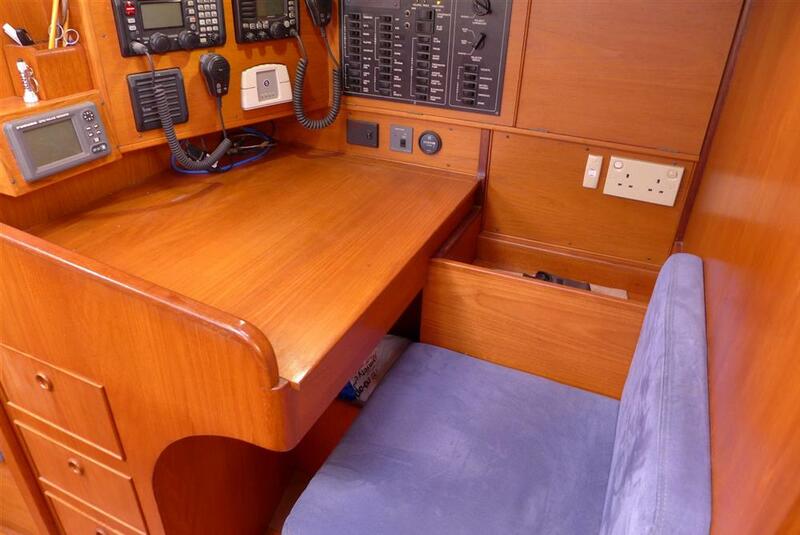 Stowage outboard and under seat. Vanity unit with hanging locker to port. Wash basin with hot and cold thermostatically constructed shower. 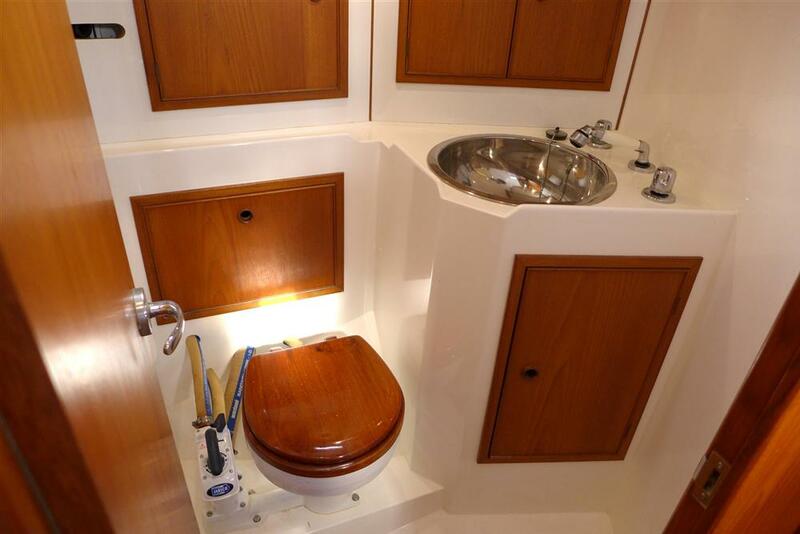 Stowage behind WC, wash basin and below wash basin. Teak grating over shower tray. Wet clothing locker with fiddled shelving and hooks. 2 x Showers in forward and aft heads with thermostatic valves. 2 x Jabsco manual WCs. 2 x Jabsco waste pumps to shower. 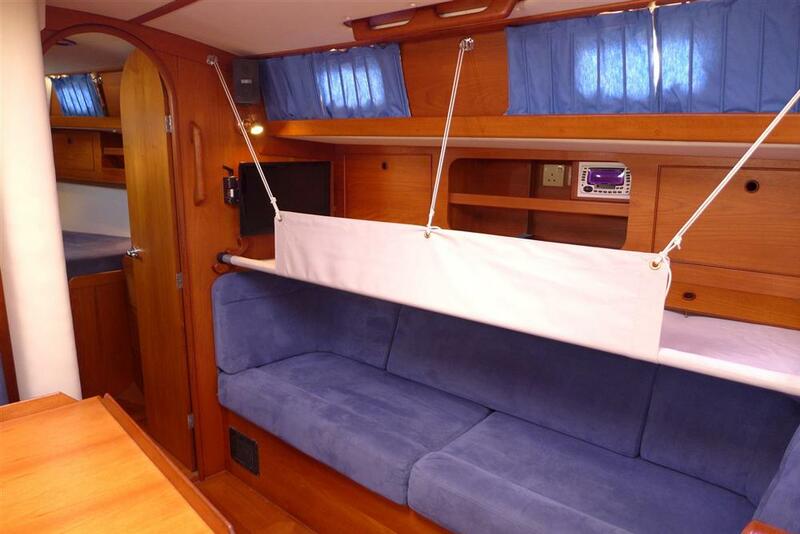 All portlights and hatches, and the companionway, are fitted with fly screens. 4 x Hella turbo 2-speed electric fans. 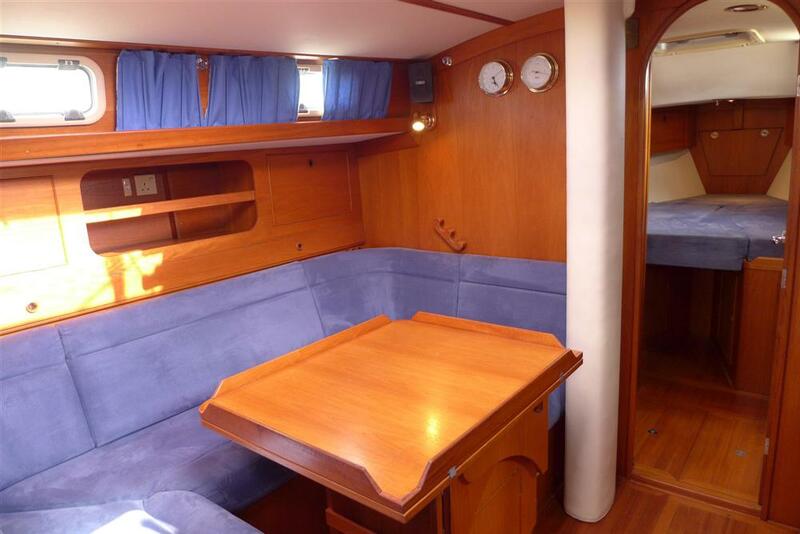 1 x in forepeak, 1 x in aft cabin, 1 x in galley/saloon and 1 x mobile fan. 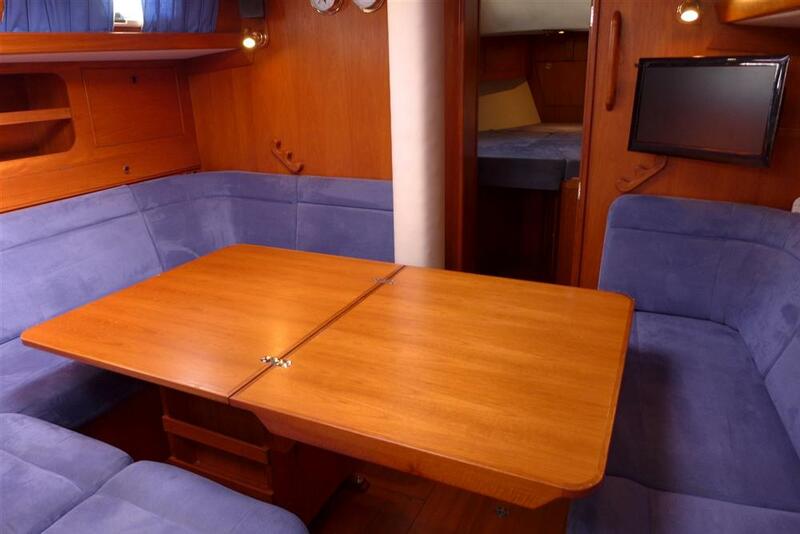 Fore cabin: 2 x LED berth lights, 1 x 10 watt berth light and 1 x LED overhead light. Forward: 2 x LED overhead lights. Saloon: 2 x LED overhead lights and 4 x 10 watt reading lights. Navigation area: 1 x LED overhead, 1 x LED overhead red and 1 x 10 watt overhead. Galley: 2 x LED overheads, 1 x 10 watt overhead and 1 x 10 watt overhead red. 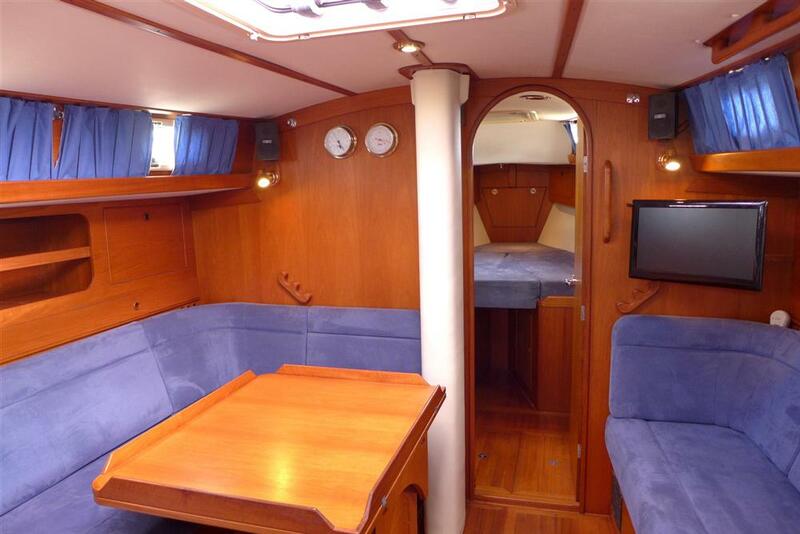 Aft cabin: 2 x 10 watt berth lights, 1 x 10 watt overhead and 1 x 10 watt overhead red. Aft Head: 2 x 10 watt overheads and 1 x 10 watt overhead red. 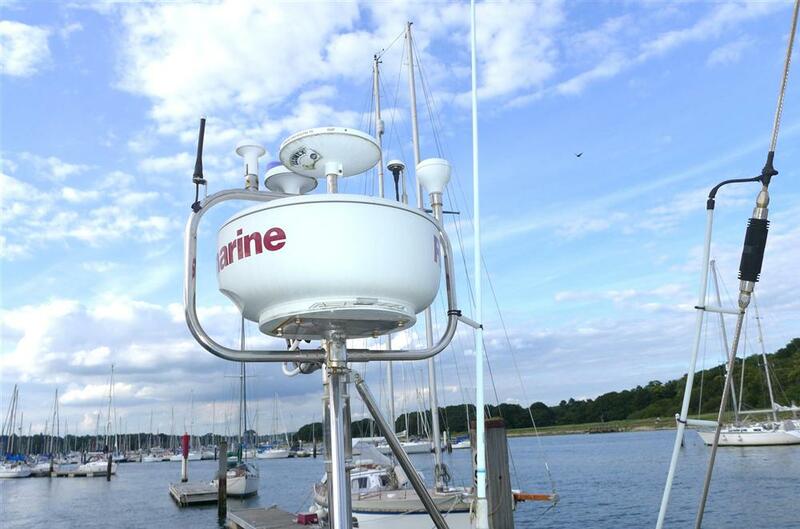 Navigation lights: 1 x 25 watt bi-colour bow light; 1 x 10 watt stern light; 1 x 5 watt LED tri-colour masthead, 1 x 5 watt LED all round white; 1 x 25 watt steaming light and 1 x 50 watt sealed beam deck light. Hull Finish: Isopthalic white gel coat. Epoxy coated and copper coat below water line. Hand lay-up, material to Lloyd’s register of shipping approver drawing. Polyester resin with chopped strant mat (csm) and woven roving (wr). Stringers, 100mmx50mm foam core with 2.4g/m2 csm and unidirectional roving reinforcing. 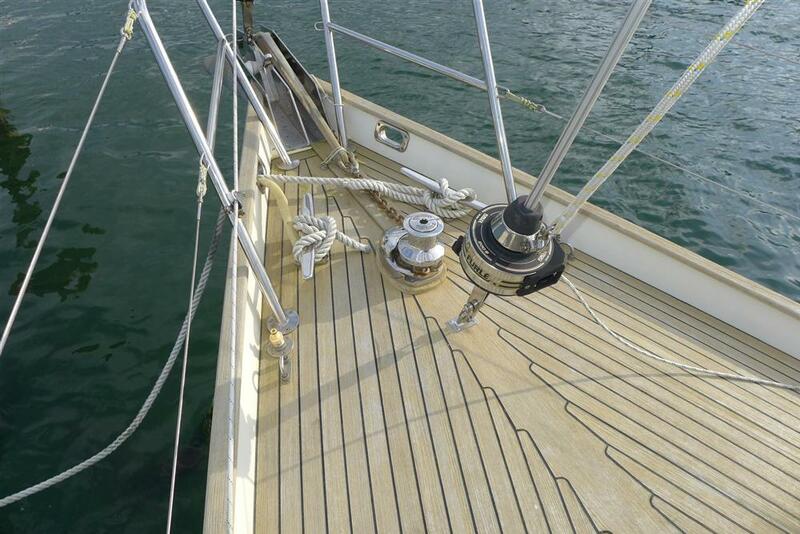 Deck is bonded to hull with epoxy resin, bulkheads bonded to deck and coachroof with csm and resin. Bronze through hull fittings, fitted with bronze ball valves and Blakes seacocks. Deck Finish: Isopthalic off-white gel coat. Single piece lead casting bolted to hull with 24mm stainless steel studs. Rudder GRP moulding foam filled with integral 44mm diameter marine grade stainless steel stock. 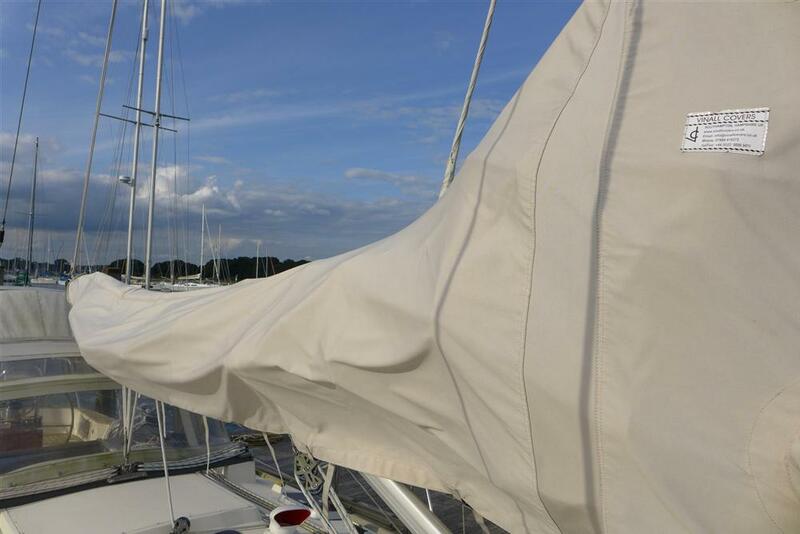 1 x Fully battened mainsail with 3 reefs (3rd reef very deep) with lazy jacks. 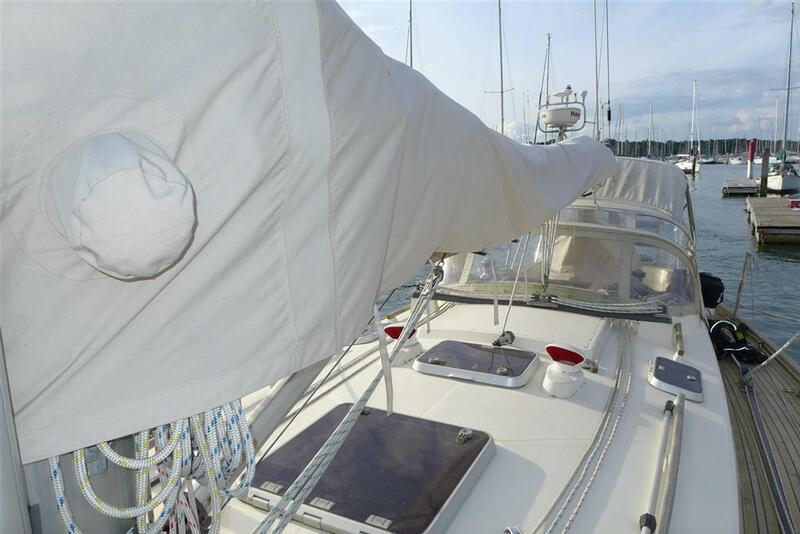 1 x Yankee foresail on Furlex furler with UV strip. 1 x Staysail on Furlex furler with UV strip. 1 x Storm jib hanked to additional forestay. 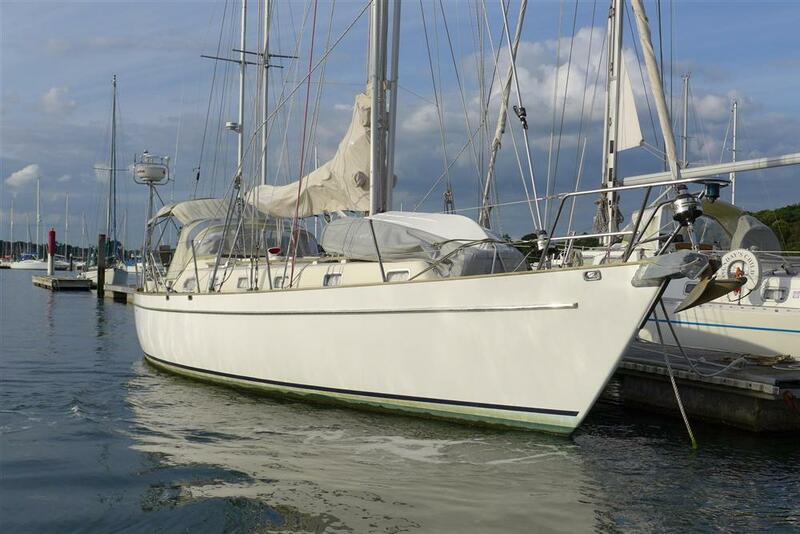 1 x Yankee foresail as twin for downwind, shorter luff. 1 x MPG 165% on furler. All sails made by Sanders Sails. Sprayhood in stone with clear panels on stainless steel frame, with hide covered grab rail. Bimini; stainless steel frame with stone covering. 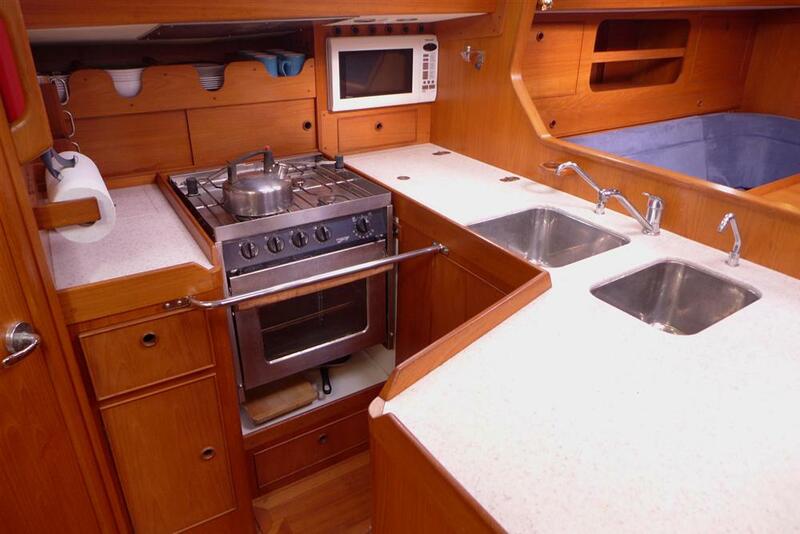 Infill panel in stone between Bimini and sprayhood, removable. Cover in stone for wheel pedestal and cockpit table. Selden C section mast, tall rig version keel stepped, cutter rig with running backstays controlled from cockpit. Additional detachable forestay with ratchet adjuster. 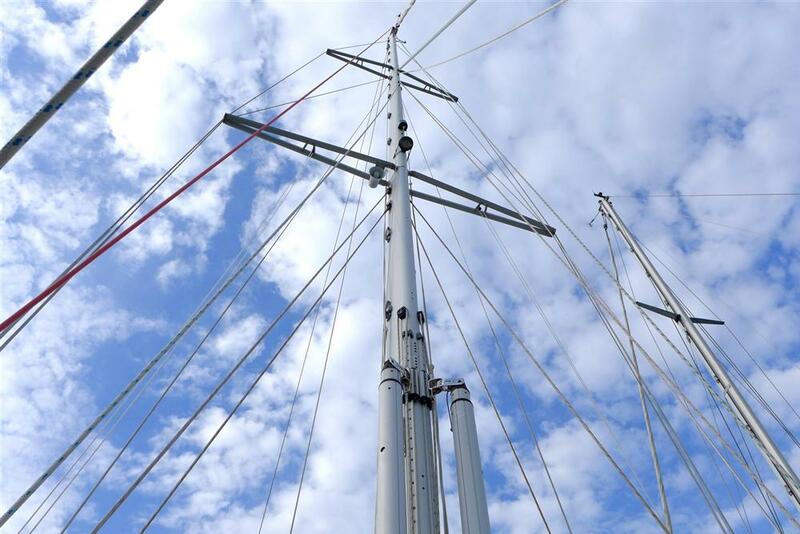 2 x Telescopic spinnaker poles stowed on mast with control gear. 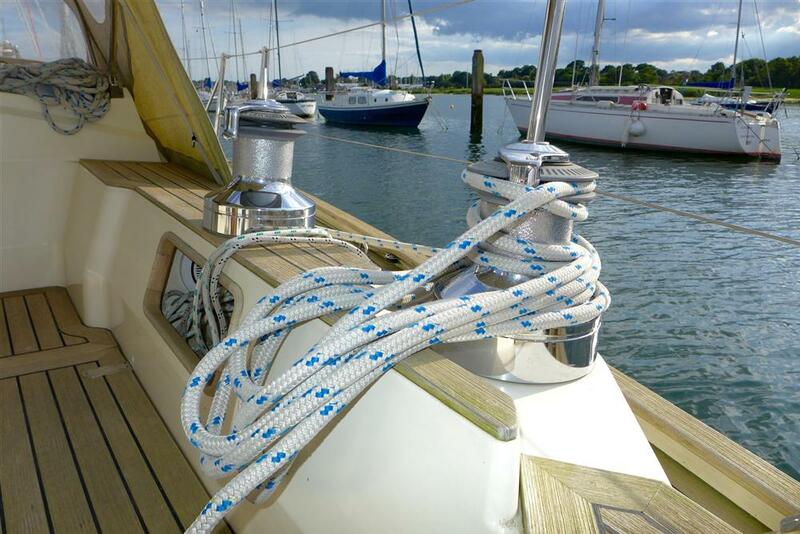 Roller furling Furlex on forestay. Roller furling Furlex on inner forestay. Rod kicker with internal gas spring. 2 x Double rope clutches on mast. 2 x Lewmar ST46 self-tailing winches on mast. Boom with single line reefing system. Folding mast steps from deck to mast head. Forestay halyard, staysail halyard, additional forestay halyard on mast. Spinnaker halyard and pole lifts on mast. 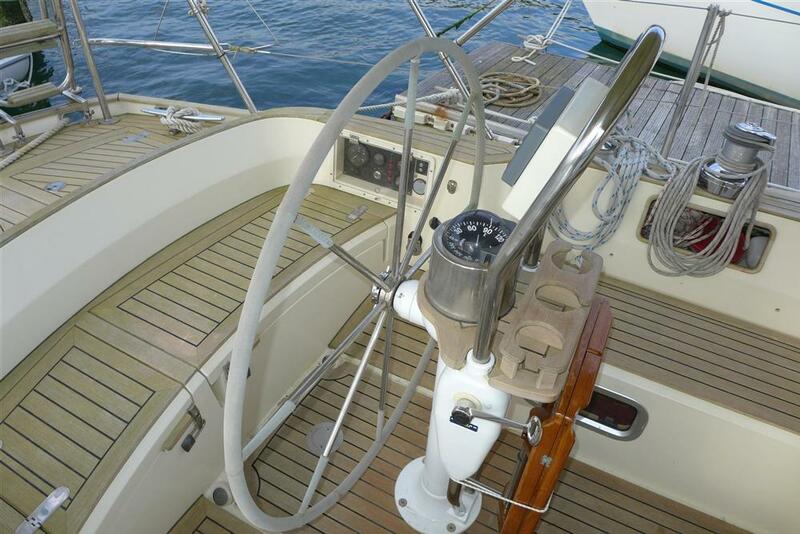 Main halyard, topping light, boom kicker, reefing lines returned to cockpit clutches. Port and starboard boom guys controlled from cockpit. Spinnaker fore and aft guys constructed from cockpit. 2 x Lewmar ST46 2-speed winches on mast. 2 x Lewmar ST46 2-speed winches on aft end of coachroof. 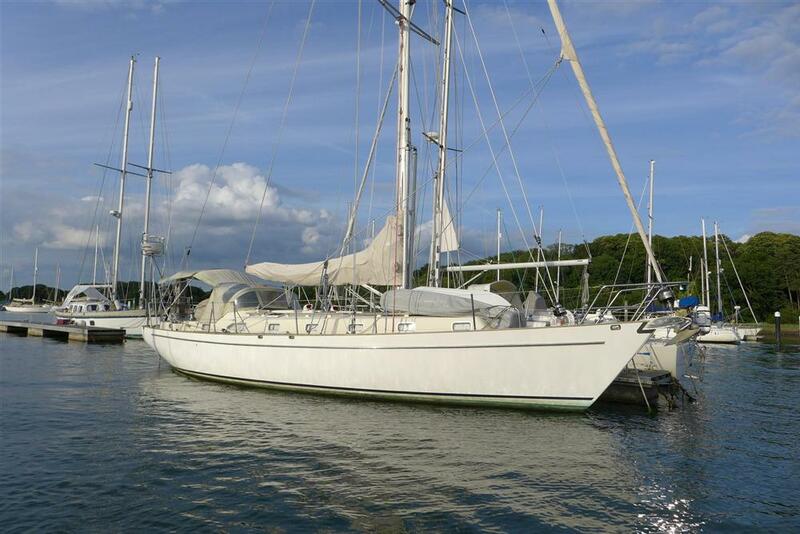 2 x Lewmar ST48 2-speed spinnaker winches. 2 x Lewmar ST54 2-speed yankee sheet winches. Substantial stemhead fitting in stainless steel with two rollers. Pulpit, pushpit, stanchions in 32mm stainless steel tubing with gateways port and Starboard. 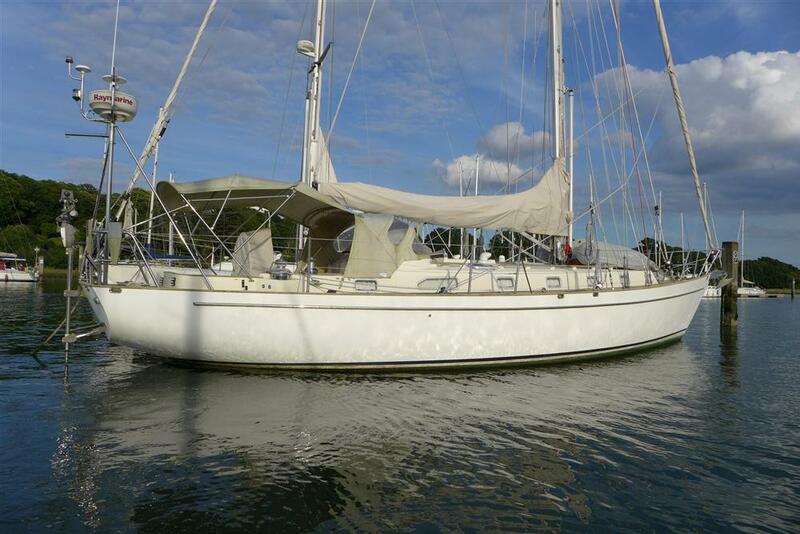 Stainless steel fairleads forward, amidships and aft, 10 in number. 10mm U bolts, 6 x port and starboard. Shroud eyes in stainless steel with brackets to structural members. Backstay plate in stainless steel. Cockpit coaming capped in 11mm teak. Cockpit sole and seats in 11mm teak. Flush hinges to aft deck hatches and cockpit lockers. 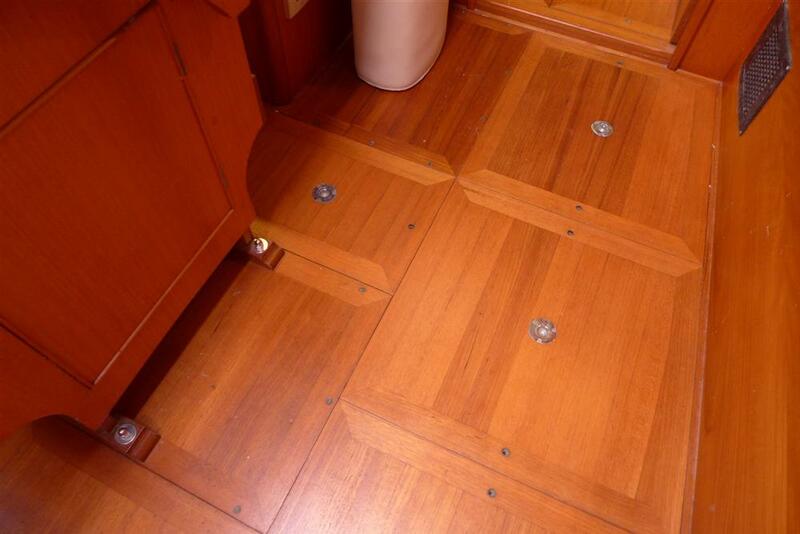 Custom locking lifts to aft deck hatches. Vents in forward cabin and forward heads. Dorades in galley. 7 x Deck hatches. 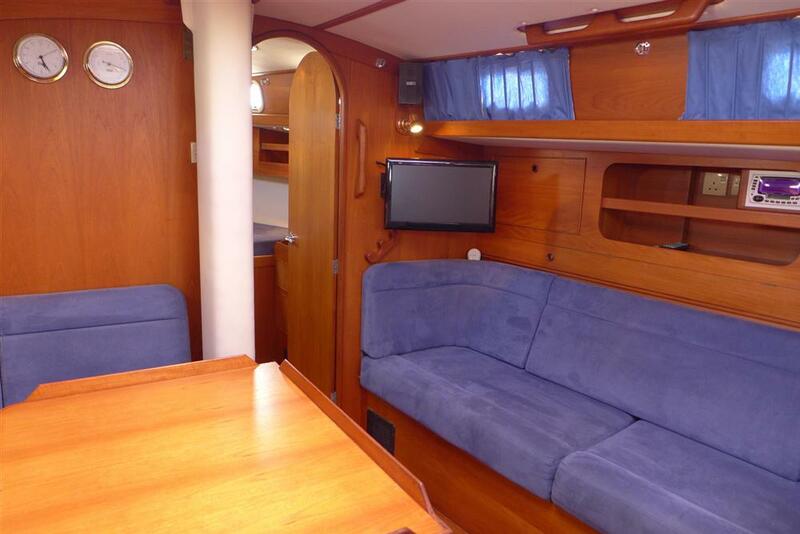 Forward cabin, saloon, 2 x in galley, chart area, aft cabin, aft head; all with fly screens. Opening ports. 3 x in Forward cabin, 1 x in forward head, 4 x in saloon, 1 x in galley, 1 x in chart area, 2 x in aft cabin and 1 x in aft heads. All with fly screens. Hand rails in teak along coachroof. 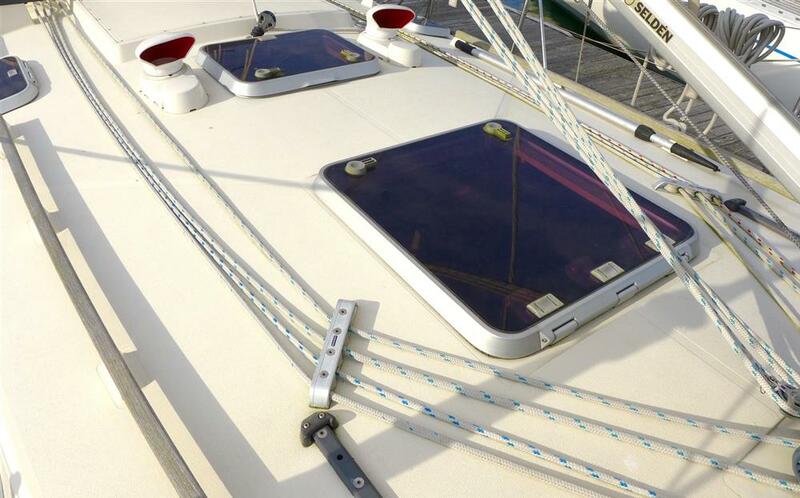 Genoa and staysail tracks in aluminium with Lewmar ocean sliders and stops. Control line on genoa track cars. Main sheet track, Lewmar ocean car with control lines to cockpit clutches. Black water pump out access plates and forward head holding tank vent. Diesel filler access plate on cockpit coaming. Self-draining cockpit with 2 x 50mm drains. 3 x Harness attachment points in cockpit. Henderson MK V bilge pump in cockpit. 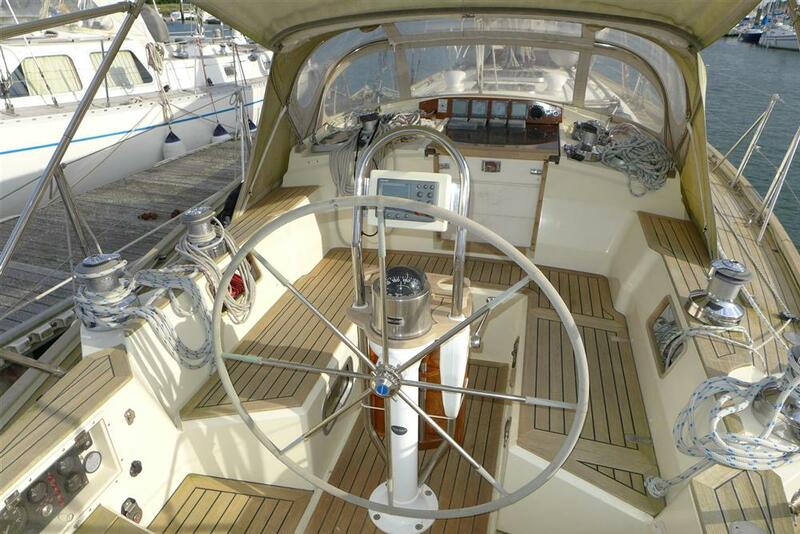 Lewmar steering pedestal with Ritchie compass. Hide covered wheel with wheel lock. 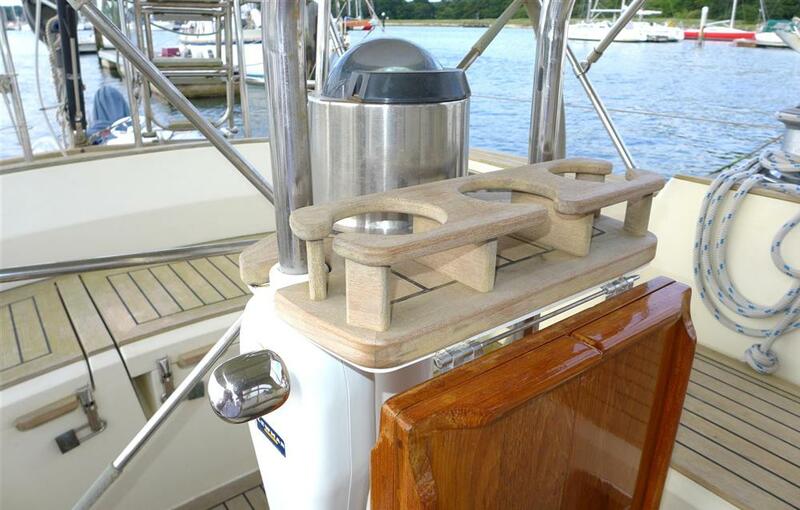 Teak glass/mug holder on steering pedestal. Folding cockpit table attached to front of pedestal. 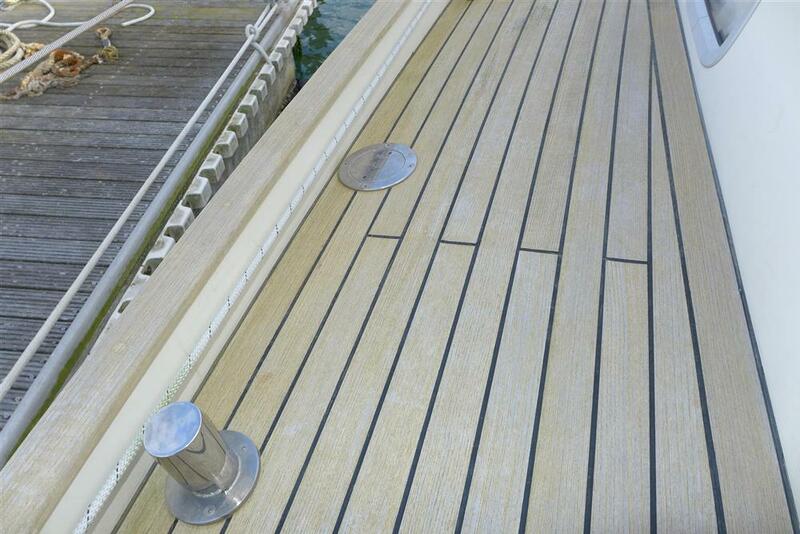 Deck wash outlet on foredeck for anchor washing. 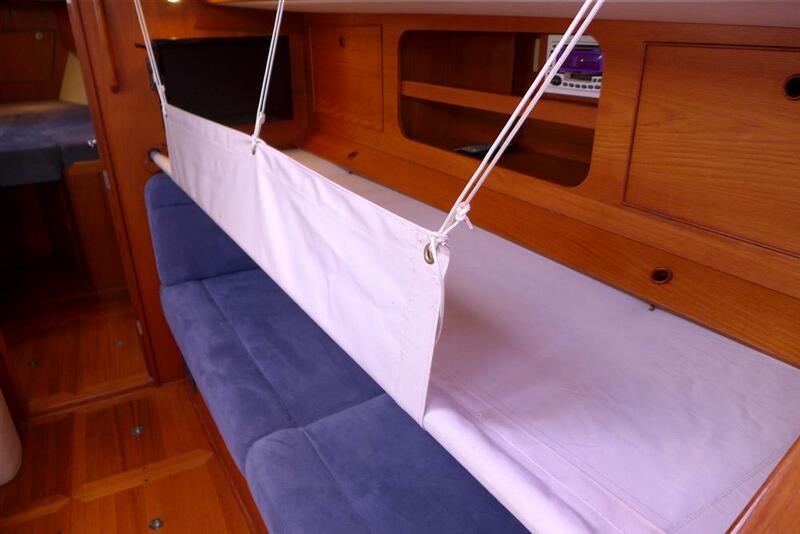 Folding swim ladder, fits stern and at port and starboard gates. 2 x Outboard stowage boards. Outboard crane on pole at pushpit. 6 x 380mm stainless steel cleats, each with 4 x 12mm bolts. 1 x Lewmar V3 windlass with foredeck switches, cockpit switches and a mobile wireless unit. Windlass complete with manual recovery kit. 60lb (28 kg) CQR anchor with 50m of 10mm calibrated chain. Fortress anchor with 10m of 10mm chain and 50m of 18mm multi-plait warp. 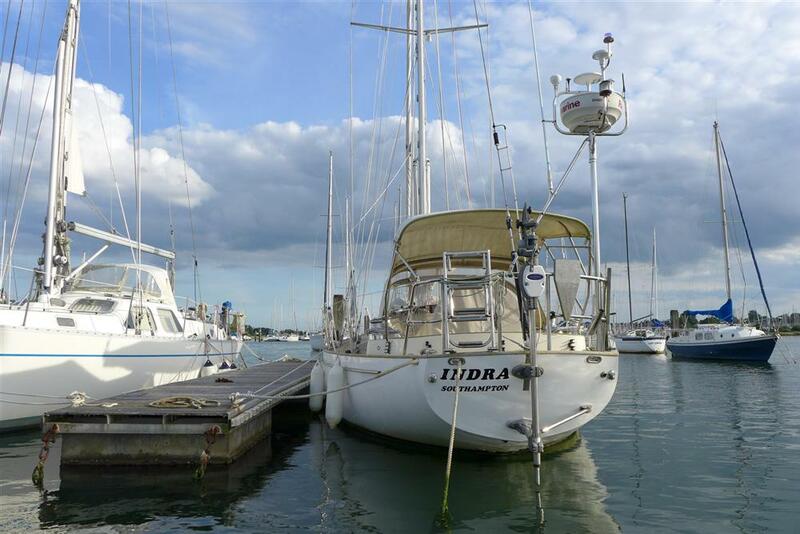 6 x Fenders and mooring lines. 1 x Beta Marine (50hp) diesel engine with TMC 260 gearbox. Twin Racor fuel filters with change-over valve. 2,150 hours (950 on tachometer hour recorder, now unreadable). Analogue meter installed at chart table, reading 1,200 hours (01/08/2014. Stripper line cutter fitted on prop shaft. 40 litre calorifier with 2 x heating coils and 1.25kW 240v immersion heater. 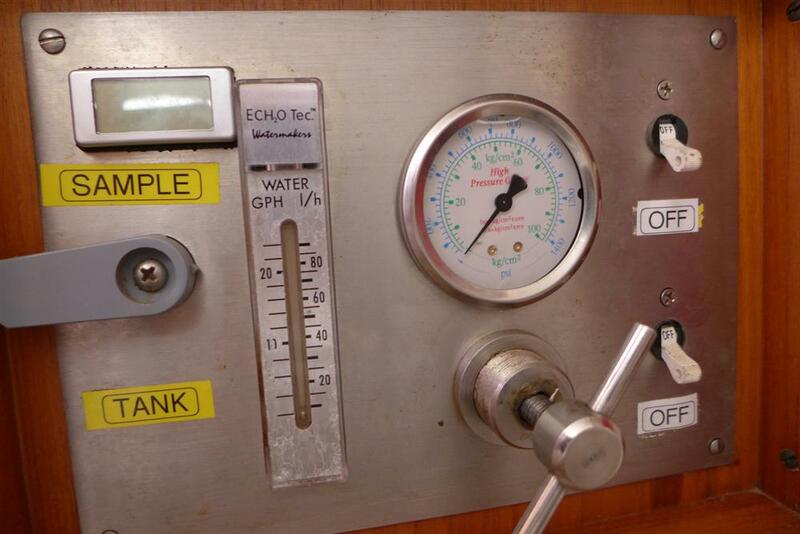 Galley provided with manual Whale MKII gusher foot pumps for cold fresh and salt water. Hot and cold mixer tap to sinks. Pressurised hot and cold water supplied by Flojet variable speed pump. Fresh water foot pump provided with a Jabsco Aqua filter. Pressurised system provided with carbon filter. 13 gallon 12v DC water maker by Echo Marine Ltd. 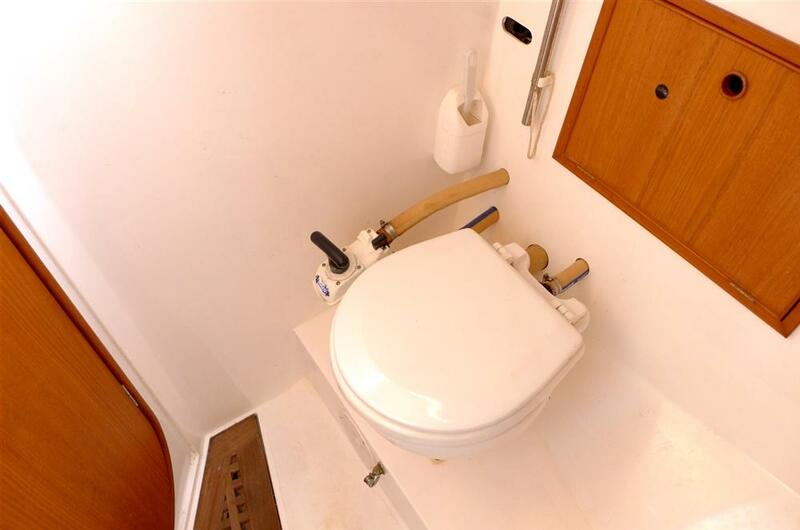 Waste pipes to sinks – reinforced PVC. Waste pipes to heads – Vetus rubber sanitation hose. Bronze Blakes seacocks, Bronze skin fittings with Bronze ball valves, Bronze skin fittings with Bronze ball valves and strainers for engine and generator. Below the water line. 316 stainless steel skin fittings with stainless steel ball valves above the waterline. 1 x Stainless steel tank, holding approximately 285 litres. Filled from cockpit coaming and vented overboard. Tank fitted with baffles and inspection hatches. 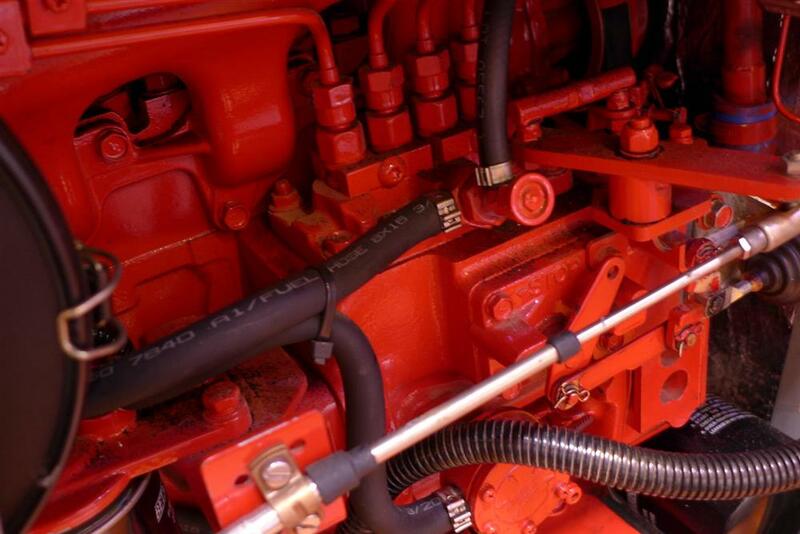 Valves to supply engine, generator and drain off. Contents measured by Tank Tended air pressure gauge. 2 x Stainless steel tanks, holding approximately 375 litres. Filled from side decks and vented overboard. Tanks fitted with baffles and inspection hatches. Waste from both heads discharged into holding tanks. 2 x Holding tanks (75 litres and 121 litres). Fitted with Tank Minder gauges with LED indicators on switch panel. Both tanks fitted with Jabsco electric waste pumps and Whale manual sanitation pumps. 2 x Manual Henderson MK V bulkhead pumps – 1 x in cockpit, 1 x in aft heads. 1 x Rule 2000 electric pump with water float switch. 4 x 6kg propane bottles stowed in aft deck locker with butane/propane regulator and change over valve. 1 x gas control system with solenoid valve and alarm system. Raymarine ST7002+ autopilot on pedestal. 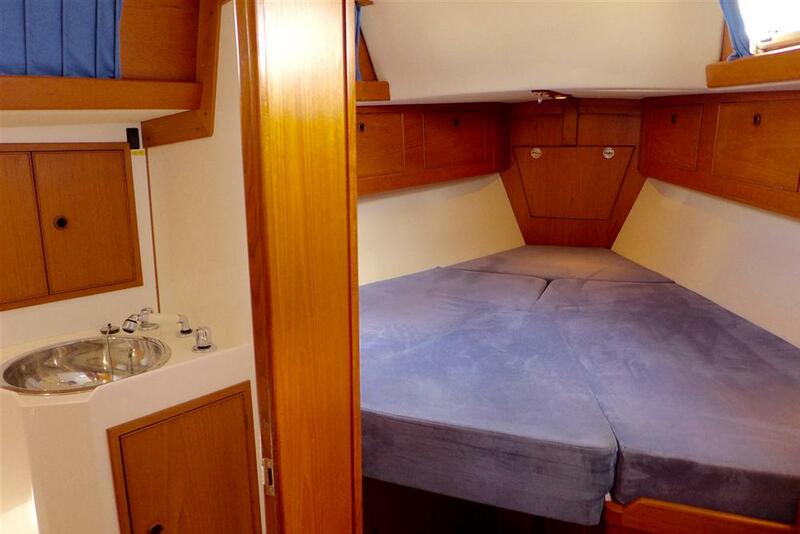 Raymarine ST60+ wind, ST60+ wind, ST60+ speed, ST60+ depth, on panel above companionway. Raymarine E80 chart plotter on coach roof under sprayhood. Raymarine SPX30 smart pilot core pack, behind starboard saloon berth. Raymarine ray pilot linear drive. Raymarine 18” 4kW digital radar on pole at pushpit. Raymarine GPS on pole above radome. Electronic antennas mounted on pole above radome. SeaME active radar reflector on mast. Furuno GPS as back up, and supplying data to VHF and SSB radio. Connections for a computer, radar and internet connection. USB connections for AIS, Seatalk and Pactor modem. Icom m505 VHF with HM162 command mic. In cockpit. 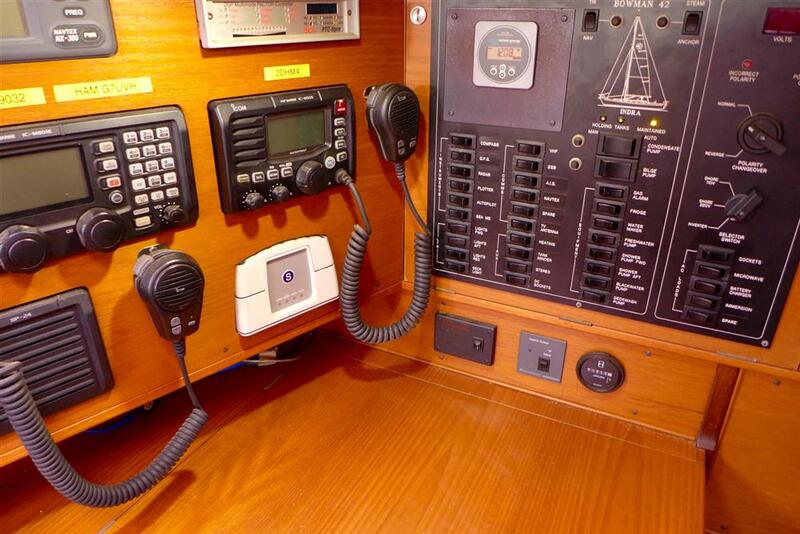 Icom m801e MF/HF marine SSB. 1 x 18” TV in saloon with antenna amplifier. 1 x Radio with CD/Cassette tape player. 2 x Speakers in saloon. 2 x Speakers in cockpit. Custom switch panels for 12v and 240v AC. Circuits protected by fuses and circuit breakers. 240v AC ring main from inverter and shore power. 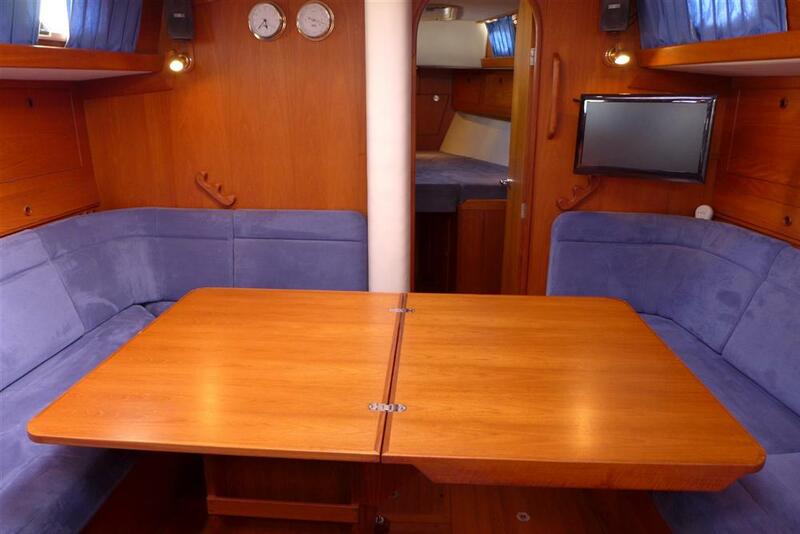 12v sockets, 1 x in forepeak, 2 x in salon, 1 x in aft cabin, 1 x in navigation area. 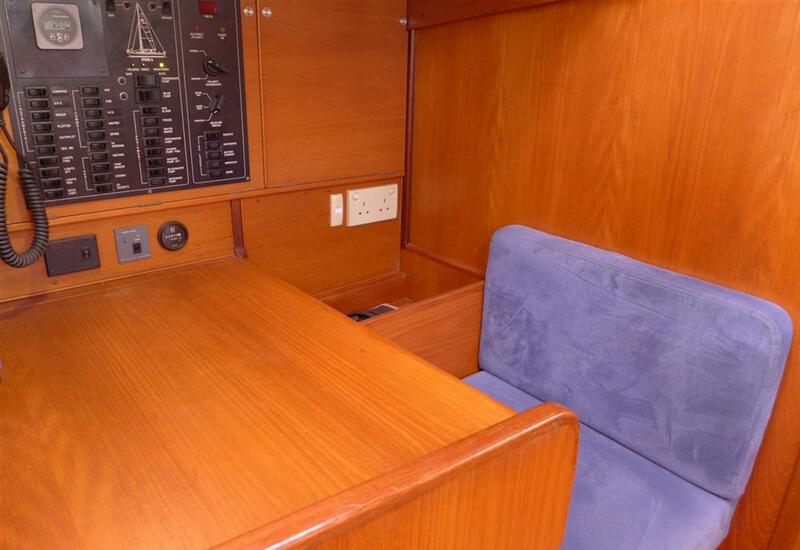 240v AC outlets, 1 x in forepeak, 2 x in saloon, 1 x in aft cabin, 2 x in galley, 2 x in navigation area. 2 x 12v outlets in cockpit. 1 x Red top 50Ah starting battery. 6 x 220AH 6v Rolls domestic batteries. Both battery banks can be combined using a keyed heavy duty switch. The batteries are secured in a covered, forced ventilated stowage area. The starting battery is charged from the domestic bank using a Xantrex digital echo-charge battery charger. Shore side charging is by a Mastervolt 12/70-3 120/240v AC. 12v 100amp alternator on engine with a Merlin alternator management system. 3 x Safety line eyes in cockpit. 1 x Horseshoe lifebuoy with light. 1 x Rescue sling with light. 1 x Extinguisher (powder) in forepeak. 1 x Extinguisher (powder) in aft cabin. 1 x Extinguisher (powder) by companionway (large). 1 x Extinguisher (C02) in cockpit locker. 1 x Fire blanket in galley. 1 x Sea-Fire FM200 engine extinguisher with engine shutdown system. 1 x 8’ AB rib, old and patched. 1 x 3.3hp Mercury outboard 2-stroke. 1 x 9.9hp Mercury outboard 2-stroke. 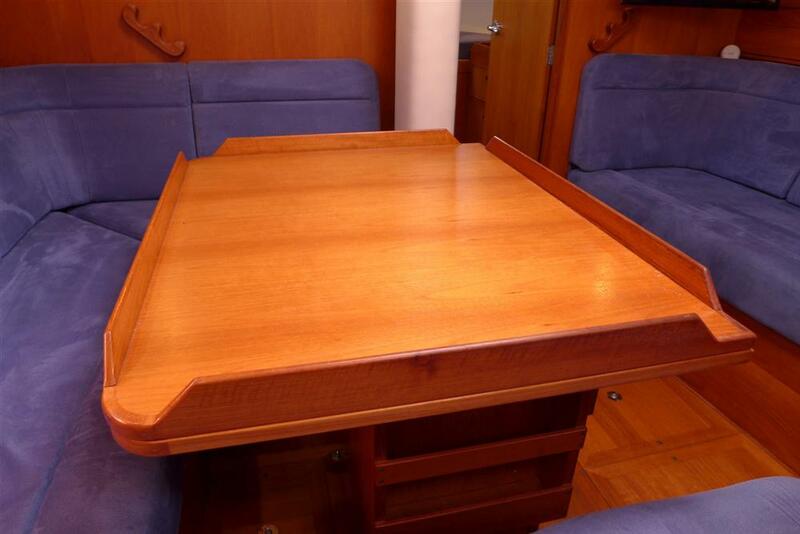 Foredeck stowage system for rib with tie downs. There is a large additional inventory that may be available by separate negotiation. Please ask for details.